Machiya Momiji has a certified history stretching back to the late 1800s and underwent a complete renovation in 2013 by local craftsmen. Officially recognized by Kyoto local government as an authentic Kyoto machiya, this property offers visitors to the city a unique opportunity to enjoy a combination of Japanese design and modern convenience during their stay. The house itself is situated on two floors and access is gained through a stunning ‘genkan’ or entrance hall that has a wealth of historical features including flagstones and a traditional cabinet. This leads into the kitchen and dining area which features a full kitchen (twin electric hob, sink, fridge-freezer, dining service and cooking utensils), wooden dining table and chairs for 4, recessed washing machine and sofa. Immediately beyond this is the ‘washitsu’/ tatami room which features a ‘horigotatsu’/sunken seating area, sliding paper screens and a view of the ‘tsuboniwa’/courtyard garden. This was designed and laid out by a local expert from a local family of gardeners. The garden features a Japanese maple tree, moss and a striking stone water feature – perfect to contemplate over a cup of tea after a busy day visiting Kyoto’s attractions such as the nearby Kennin-ji Zen temple! The downstairs WC and luxurious bathroom, which itself has a private view of the garden, completes the first floor. On the second floor, both western and Japanese bedrooms are connected by a mezzanine floor that overlooks the dining area. The western bedroom has twin beds (that can be pushed together), closet and en-suite WC while the Japanese room provides flexible futon sleeping arrangements. The intricate roof beams, which are an important aspect of machiyas, have been exposed on the second floor giving a sense of space and light throughout. Machiya Momiji is located right on the doorstep of some of Kyoto’s key attractions including the UNESCO World Heritage designated Kiyomizu-dera, the Gion entertainment district renowned for ‘Geisha’ and Kabuki and the Kamogawa river, famous for summer dining platforms. With a huge range of restaurants, bars, supermarkets, traditional craft shops and excellent transport links to the rest of the city and beyond (including direct trains to Nara and Osaka), Momiji is superbly located. Yet Momiji also offers an opportunity for clam, rest and relaxation as it is located in a quiet neighborhood just off the bustling streets. In summary, this Machiya will not disappoint the discerning visitor to the beautiful and enchanting cultural capital of Japan. Restoring a Kyoto machiya (which translates as ‘town house’) was a long standing dream which we finally realized in 2013. As a professor at a local university, I originally purchased this property to be our family home but a new position has led to relocation away from Kyoto meaning that we can now offer our home as a vacation rental. We searched long and hard for the right sized property in the right place, and this it. Machiya Momiji (momiji translates as ‘Japanese Maple’ and we have one in our garden!) is located in the heart of a traditional neighborhood on the doorstep of some of Kyoto’s most famous and stunning cultural treasures such as Kiyomizu-dera which is just a ten minute walk away. A short walk along the Kamogawa river brings you to the bustling heart of Kyoto around Shijo Kawaramachi and the Gion entertainment district, famed for Geisha and Kabuki. On purchase, the property needed complete renovation and we worked with a local company, Hachise, that specializes in the renovation of traditional Kyoto machiya. They are also renowned for their high standards of craftsmanship which comes from working exclusively with local specialists. Kyoto machiya offer an excellent alternative to hotels and a chance to experience the Japanese lifestyle. We have combined traditional Japanese design, such as the main tatami room complete with horikotatsu (sunken seating area) and shoji (sliding paper screens) with contemporary comforts such as luxury bathroom, heated floors, the latest in Japanese toilet technology and a fully fitted kitchen. Externally, the house reflects traditional machiya design and the greatest of compliments have come from our neighbours who are delighted with how the place looks. Calm and quiet, Machiya Momiji presents an opportunity to relax and enjoy the design and space of your own house during a stay in beautiful Kyoto. toilet, tub, shower, bidet, A key feature of the house. The bathroom is a key feature of the house. The walls are fully tiled apart from a section around the bath which features hinoki (a fragrant wood traditionally used in Japanese bathtubs). The deep tub and subdued lighting is designed for relaxation while a secluded window offers private views of the traditional garden. Hand wash, body wash, shampoo and conditioners included. Another key feature of the house. A traditional tatami room with sunken seating area (horikotatsu) and sliding paper doors that overlooks the small yet perfectly designed garden. Table and chair set from a local carpenter. A beautiful tsuboniwa (small garden found in townhouses) designed by a local artist from a local family of gardeners. Featuring a Japanese maple tree, moss and a stone water feature. Merci à Andy et Naoko pour leur disponibilité. Tout est bien expliqué, du fonctionnement des équipements aux informations touristiques. Nous avions les réponses à nos questions immédiatement par mail, la réservation de taxi pour aller à la gare a été gentiment gérée par Naoko. Le machiya Momiji est bien équipé et chauffé (si besoin), il est situé dans un quartier calme,une bonne boulangerie et un petit commerce se trouvent à 5 minutes à pied. Il faut cependant marcher plus loin pour atteindre les sites à visiter. Le temple Kiyomizu-Dera est accessible à en 14 minutes de marche et le quartier de Gion en 25 minutes. Sinon, un arrêt de bus est à 10 minutes de la maison. What a wonderful place to stay! Naoko was a very gracious host providing us with lots of valuable information ahead of time and during our stay. The Japanese directions & map to hand to a taxi driver were priceless! There were lots of directions and information inside the home as well. And such beautiful amenities and extras made our stay even more pleasant. The filtered coffee packets (ingenious! ), teas, shampoos, body washes, etc. made our stay that much easier. If I had any "complaints" at all it would be that the location isn't exactly perfect. While it was nice to be in a quiet, residential area; it was about a 10-15 minute walk to the majority of restaurants at night. While this doesn't sound so bad; after walking miles and miles all day long it was tiring to think about going back out for another walk to dinner (and if you don't have reservations and are a family of four you will do a lot more walking to find a place that will take you in). For two of our nights we just stayed out all day and didn't return to the house until after dinner. Another night we gave up and bought food from the nearest grocery store (surprisingly decent, but still) and on another night we went to a close by suggestion for yakitori run by a family and that was wonderful! Great local find from Naoko! She also suggested a nearby udon place (but we had already had our share of udon) and an izakaya (after checking the menu and atmosphere it didn't seem too kid friendly. plus many izakayas allow smoking. so we passed.). Anyway, overall, a super stay! Would definitely recommend. Naoko was also kind enough to arrange a taxi to pick us up right out our front door on the morning of departure. Very helpful!! Arigato for everything Naoko!!! We hope to return some day! Our favourite spot on an 18-day trip around Japan. 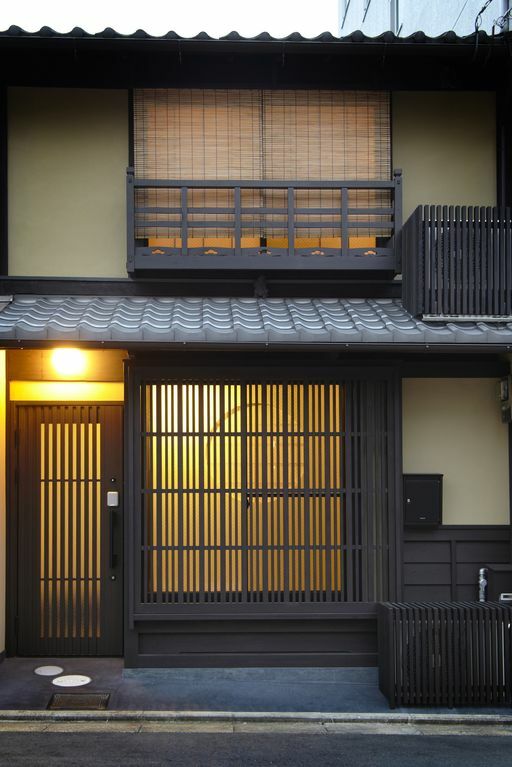 Adorable, roomy, beautifully/lovingly restored spot in a perfectly located part of Kyoto. Thank you so much! We hope to return. This property is as beautiful as it looks in the photos. It is impeccably clean and the finishes are top notch throughout. The bedrooms are roomy and comfortable (and my children loved the fact they had an opportunity to sleep in a tatami room) and there are two toilets and a beautiful bath area. There was also Apple TV (with Netflix)! The location was excellent - walking distance to the subway, restaurants and a further walk to the shopping area (15 min). We also walked to the Kiyomizu-dare Temple (15 min) which was amazing. Naoko was a fantastic hostess - very quick in responding to our questions and offering to book a taxi when we were leaving. I would highly recommend this property to anyone - it was an amazing experience to be able to stay in such a historical and luxurious place.